I spent the early hours of my fourth day on Live Below the Line lying awake, worrying about an egg. I’d made a meal plan to stretch £5 of food over 5 days (here), but now I was worried that a sliver of cream cheese and an egg on Day 4 wouldn’t be enough protein to stave off gnawing hunger pangs, compared to the immensity of two eggs and 100g kidney beans on Day 5. It felt like one of those plastic puzzles with the grid of squares. If you move one piece to fill a gap, you have to move another to fill the new gap, then another. If I ate an extra egg on Day 4, what could I eat instead of an omelette the next day? Did I have enough bread for an egg sandwich? Could I make a form of tomato ketchup with the tiny bit of tinned tomatoes left, so the sandwich wouldn’t be so dry? But then, did that mean I wouldn’t be able to make any soup with the tomatoes? Round and round, pushing tiny squares of food into different patterns. A restless night. Yet another reason to be grateful that normally I would sleep soundly with enough food to feed my family in the fridge downstairs. Won’t be faffing around with pineapple syrup again any time soon. In the end I threw caution to the wind, and used the extra egg. 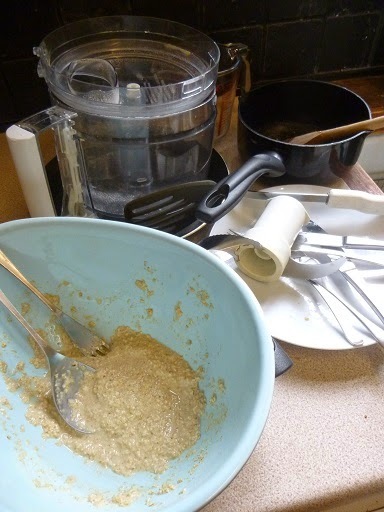 Fed up with porridge, I decided to make pancakes using oats, inspired by Ceri at Natural Kitchen Adventures’ cinnamon oat pancakes on Live Below the Line last year here and the barley pancakes by Jack Monroe this year. 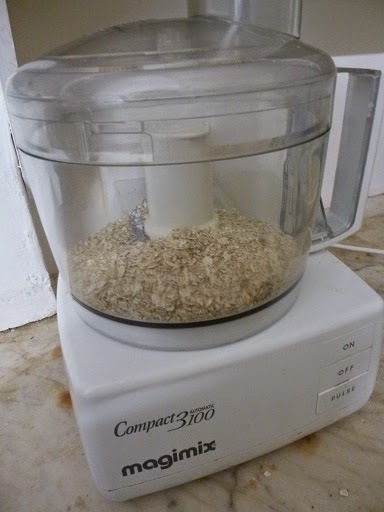 I took a punt on grinding up 75g of porridge oats into flour. 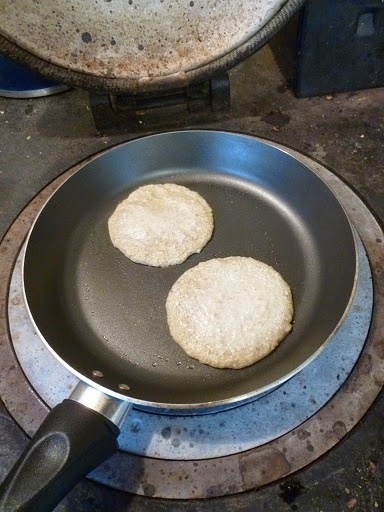 I added a beaten egg and 100ml of skimmed milk, which gradually soaked into the oat flour making it less liquid, then fried dollops in a non-stick pan. Oat pancakes. In a frying pan. Half the mix made three smallish pancakes, so I saved the rest for another day. 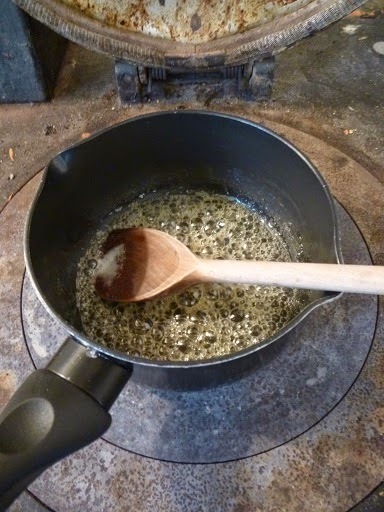 Meanwhile I tried to make some kind of syrup by heating up half the juice from the tin of pineapple, so it would reduce and become sticky. Oops. 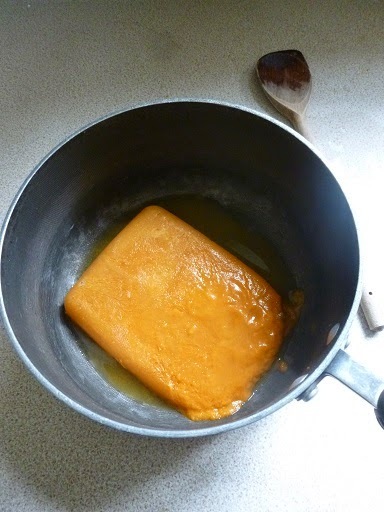 Pineapple juice toffee, rather than slightly reduced syrup. 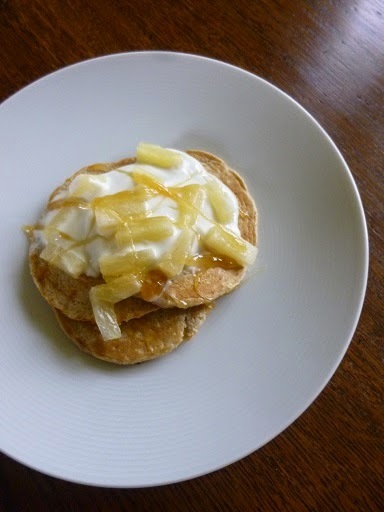 I ate the pancakes with 20g of the remaining natural yogurt, 20g of the tinned pineapple, and some syrup caught just as it caramelised. 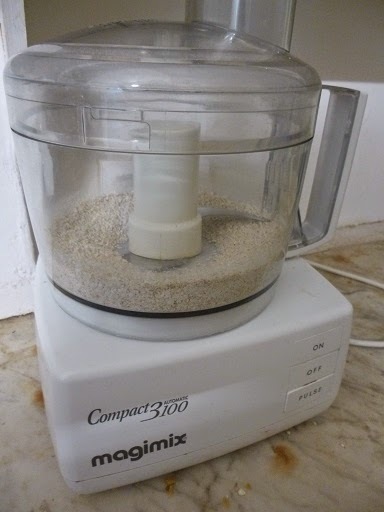 It tasted really good, nice sweetness balanced with oats, and better than pancakes I normally make with white wheat flour. Many cheers. 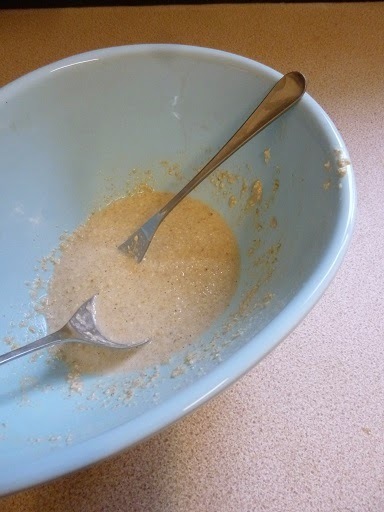 However, the amount of washing up was horrendous compared to a bowl, spoon and measuring jug for porridge, so don’t think it’ll become an everyday experience. Thicker pancake mix and a ton of washing up. You remember that carrot & ginger soup I made on Day 1? And froze a portion for later, to make sure it wouldn’t go off (a particular horror when living on so little food)? And then forgot to defrost on the day when I planned to eat it for lunch? Unsurprisingly, shouting “Hurry up I’m hungry” at the saucepan did not make the carrot soup defrost any faster. Frozen soup. In a pan. I did however manage to get a couple of oat flatbread balls out of the fridge in the morning, so they’d be room temperature by lunch time. 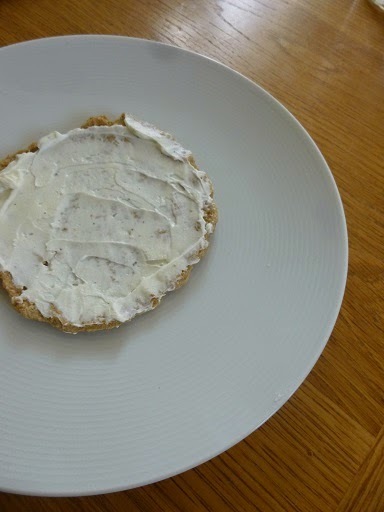 They were less sticky now, and I managed to roll them out between two sheets of greaseproof paper before cooking them in a frying pan and spreading them with almost all the remaining yogurt cream cheese. I added a spoonful of yogurt to the soup, and arranged the bowl and flatbreads very carefully on a plate ready for a photograph, then wandered off to do something else, and ended up wolfing it all down before I remembered to take a photo. 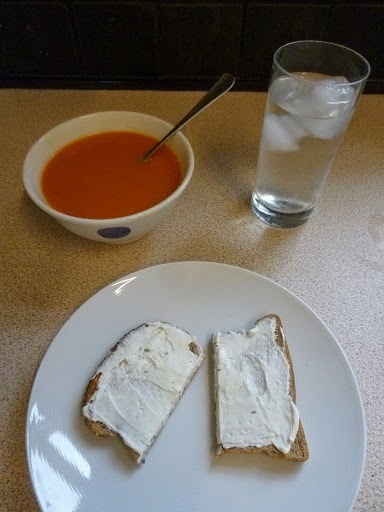 But the soup looked remarkably similar to the version on Day 1, and the flatbreads pretty identical to this one on Day 2. 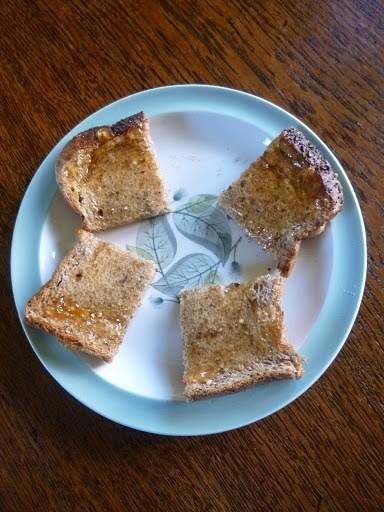 Unfortunately cutting the toast in squares did not make it last longer. Live Below the Line nearly became a source of marital disharmony today. I’d put a piece of bread in the toaster to make a snack, then wandered off to do something else, and later (much later, to be fair)discovered my husband tucking into my piece of abandoned toast. Topped with salami, no less. Only on LBTL would it become a moral dilemma about whether it was OK to substitute one of our normal pieces of bread for the missing piece of cheap LBTL budgeted bread. In the end I decided that anyone genuinely living on a minimal budget wouldn’t have spare bread lying around the place, and if someone else ate their food, they’d just go hungry. 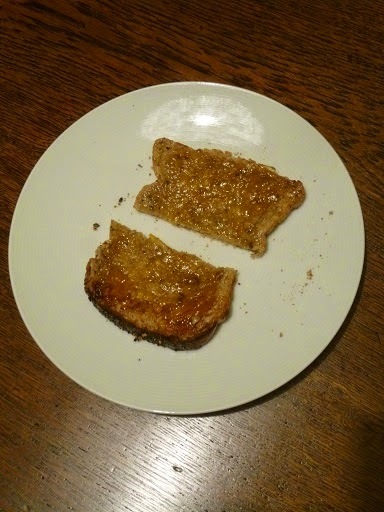 So I included the cost of the missing slice in my budget, and made another piece of toast and marmalade for me. It tasted great. Morrisons M Savers marmalade – I recommend it. Bargain at 25p. Sweet and sour egg-fried rice from a strange angle. 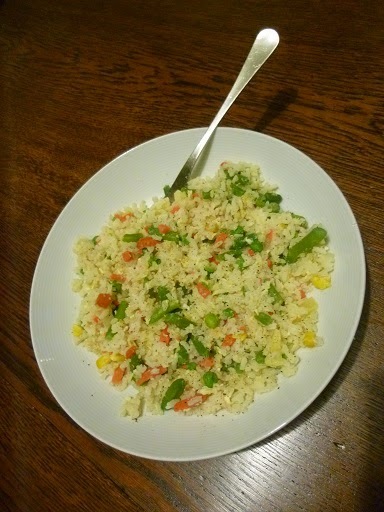 As a spin on Day 2’s egg fried rice, I chucked in 30g of tinned pineapple and a couple of spoonfuls of the juice from the pineapple tin, along with 75g dry white rice, 120g frozen veg, the last teeny bit of root ginger, some stock cube and an egg. I was hungry, it was fine. Toast. As eaten by me, and not my husband. I spent part of today working out what I had left for the final day of Live Below the Line, so knew I had enough to snaffle an extra piece of toast and marmalade before bed. Perhaps it’s the minimal food that’s making me quite so distracted and forgetful today. Today I spent 82p on three meals and two snacks. The multitude of tiny decisions – can I eat this? Do I have enough? Should I check what’s left? – is tiring. Simultaneously the very lack ofchoice – repeating meals, always limited to the cheapest options, having to plan ahead or go hungry because you can’tafford to buy extra food when out – is frustrating. In the artificial world of Live Below the Line, I’m also simultaneously cooking normally for my children and husband. It’s hardly extravagant food, things like bacon quiche and macaroni cheese, but it’s strange not to be sharing it with them. I miss the convivial nature of eating together, and tried to cook my pancakes this morning before the children came downstairs, so they wouldn’t claim a share of the limited rations. Nor can I afford sociable cups of coffee in a local cafe while on Live Below the Line. I’m doing Live Below the Line to raise money for UNICEF, and their work to keep children worldwide protected, fed and healthy, including the current campaign following the earthquake in Nepal. If you can spare it, even a pound makes a difference to families living in extreme poverty. Yes saves so much time if you have a big enough budget to make enough for several meals at once, and freeze some. I was also frustrated that the tiny portions were so expensive – with more money I could have bought bigger packs of eggs/bread/bananas/oats etc, so it was cheaper per kilo or per item. I've become much more aware of the cost per kg, and not just pack cost, since doing Live Below the Line.